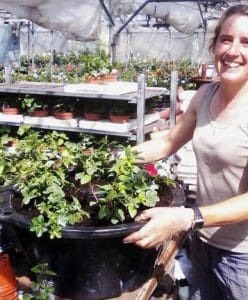 Catherine planting hanging baskets at Woolpit Nurseries! 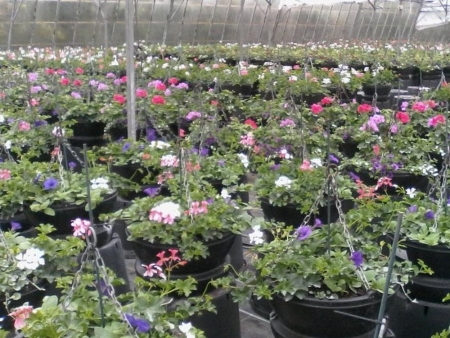 Hanging baskets & containers planted & sold at Woolpit Nurseries. Choose your colour, plants & size. 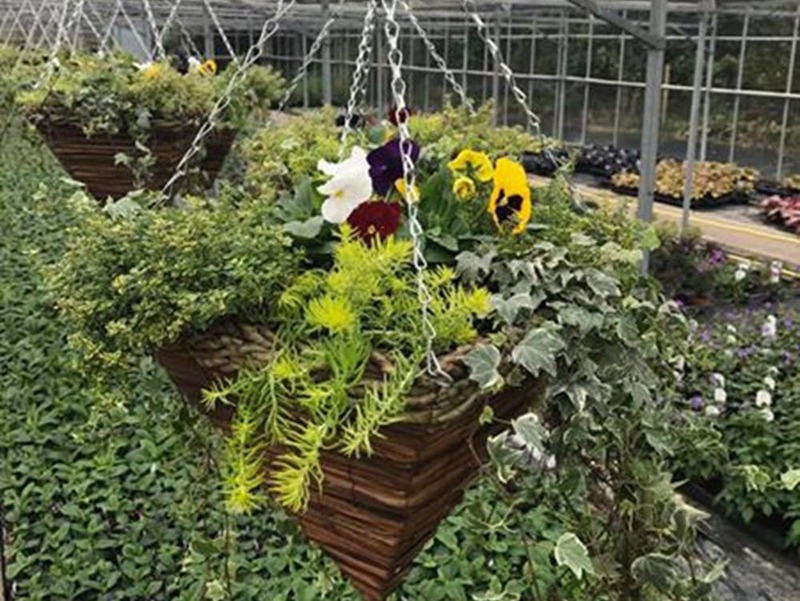 We are famous for our hanging baskets at Woolpit Nurseries, and planting over 2,500 hanging baskets every spring. Small and large baskets are planted in a variety of colour schemes, basket shapes and prices. All are planted with our own top quality garden bedding plants, including Geraniums, Fushias, Begonias, Petunias, Pansies, Foliage and much more. For orders placed before the 12th April, we can make your hanging basket to order. Tell us your colour scheme and your preferred flowering bedding plants. And we can also add evergreen hardy plants if you prefer. 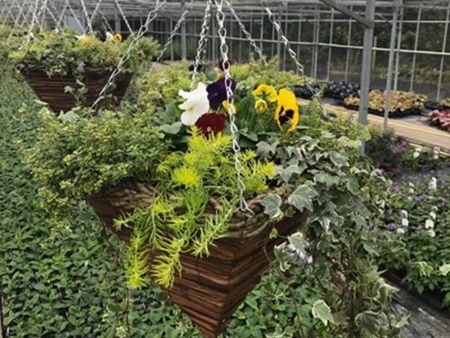 Once planted we will look after your planted hanging baskets until the weather is suitable for them to go straight outside (usually from the end of May). 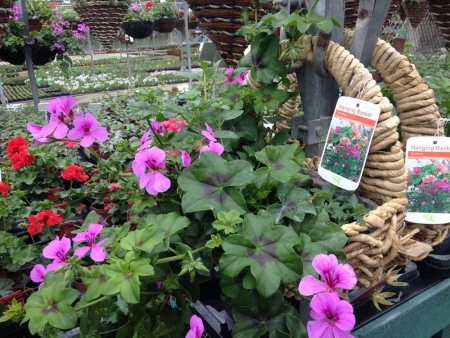 We can Refill your Hanging Baskets for You - SAVE YOURSELF SOME TIME! 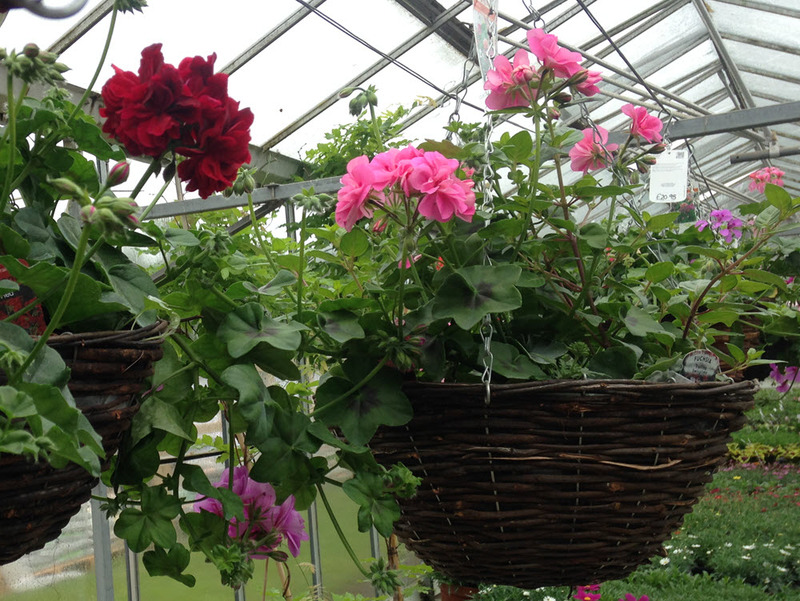 Bring your hanging baskets in to be filled & replanted. You choose your favourite bedding plants or your preferred colours to be included in your baskets. Then we’ll do the rest. We’ll replant to fit your requirements, using our quality plants and professional compost. 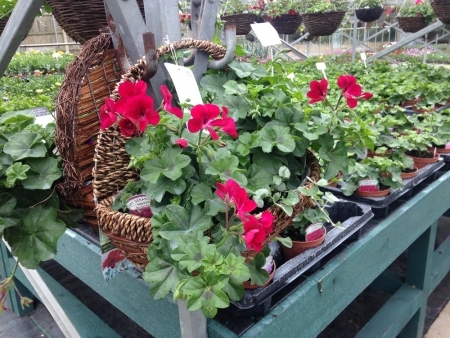 Then we’ll look after your baskets until the weather is suitable for them to go straight outside, usually the end of May. 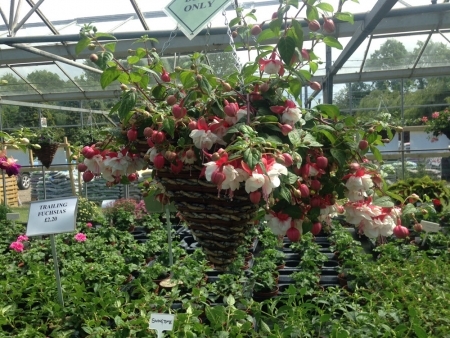 We always get our hanging baskets from Woolpit this year they have surpassed even their high standards. 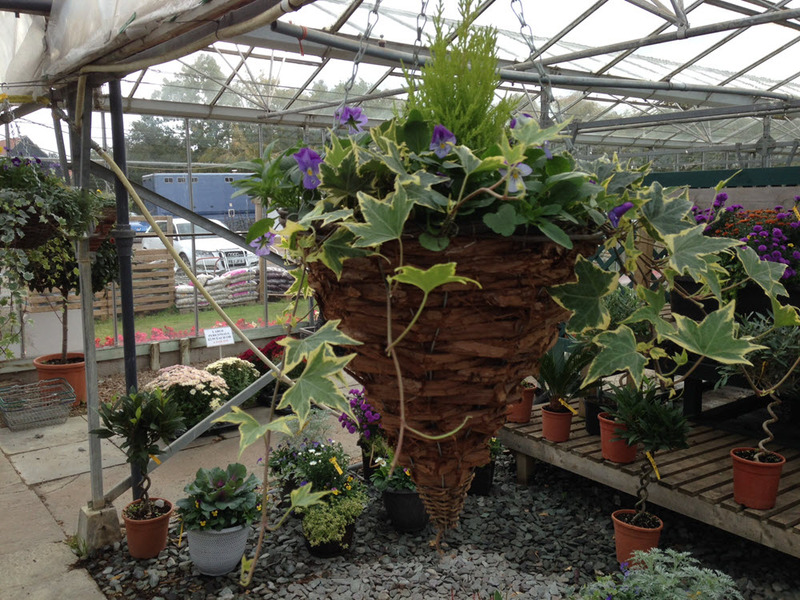 Our hanging baskets are still wonderful at the end of October. 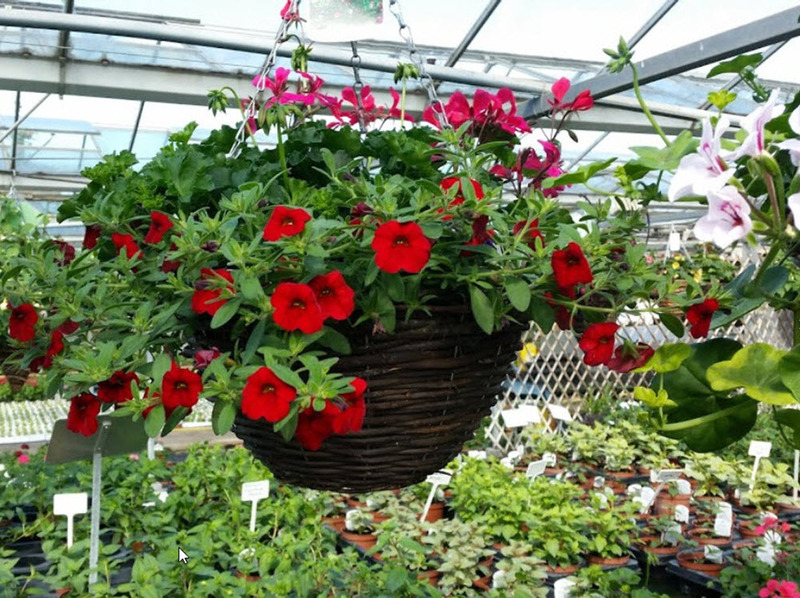 Flowering bedding plants add instant colour of your hanging baskets whilst structural hardy garden plants in baskets or containers grow and flourish through all the seasons. And a combination of both can work well as a base for an interesting display across the seasons. We stock a vast array of hardy plants all year in our Hardy Plants Center, including Ornamental Grasses, evergreen Bay Trees, Mediterranean Olive Trees and Japanese Acers. 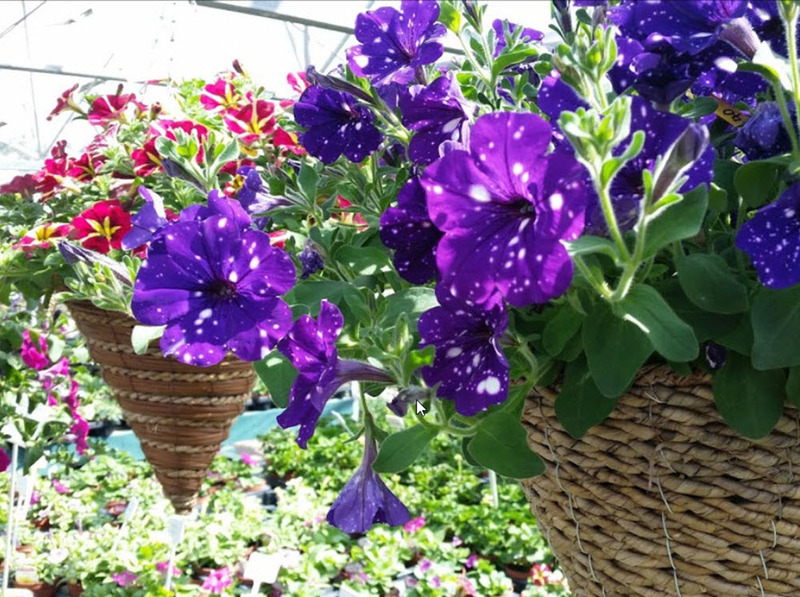 And once you’ve decided which hardy plants to include in your baskets, then take a look at our large selection of pots for planting your garden plants.